Britain is having a love affair with all things French. As well as hosting the current state visit by President Sarkozy and his new wife we have the first IRCAM academy in the UK in April. Is it a sign of these devolved times that the event is not in London, but is being hosted by the BBCSSO and led by Jonathan Harvey in Glasgow on April 7-12? Or is it because, as I've said here before, the BBCSO is on a roll? Read more in today's Guardian, including the inside track by Jonathan Harvey on new IRCAM technologies. 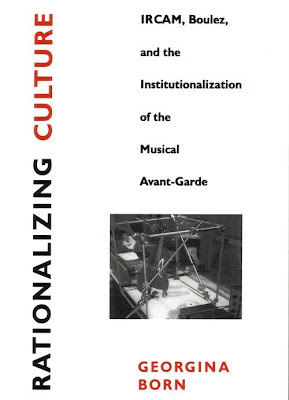 One of the few books to explore IRCAM is the snappily-titled Rationalizing Culture, IRCAM, Boulez and the Institutionalization and the Musical Avant-Garde. Anthropologist and Cambridge don Georgina Born spent a year in IRCAM in Paris producing her ethnographic analysis and if both the title and the book itself reads like a Ph. D. thesis it is not surprising as that is how the book originated. Which means that, unlike Joan Peyser, Georgina Born leaves Boulez's private life off-limits; although it is not all the stuff of dissertations and Michael Jackson receives no less than five mentions. The 1995 publication date means that the avant-garde is today rather more avant. But, nevertheless, Rationalizing Culture is a brave attempt to get inside the culture of an important and little-understood creative hot-house. Quite appropriately the book is published by the University of California Press using the latest print on demand technology. More on Jonathan Harvey here.